I understand that cost is a significant factor not only when considering whether or not to access therapy at all, but also to look at the number of sessions a client can afford going forward. For most sessions, I charge £60 per session, but for more information visit the booking page. 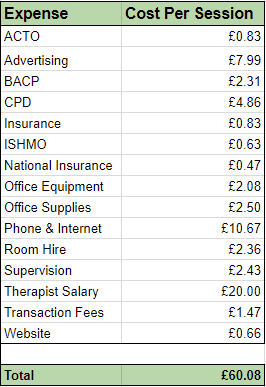 I have a transparent pricing structure outlined here - it is important to me to make clear what portion of the fee charged meets each different cost - costs have been calculated on working with a maximum of sessions per week and providing the therapist with 4 weeks annual leave. There are therapists working for the NHS as well as many working for charities. It is sometimes possible to access therapy for free. However, there are often different barriers than cost when trying to access free counselling. NHS mental health services are overwhelmed by demand, and quite rightly there is an ethical duty to triage to ensure that those in the most life-threatening need get the most urgent access to mental health services. However, this means that those still in great distress but which is not life-threatening face very long waits, almost always months and sadly all too frequently waits of over a year. In one part of Wales in which I've has lived, the waiting list as of July 2017 was reported to be nearly 2.5 years. Accessing private therapy allows you to start immediately. Many charities that offer therapy do so through government funding, and that usually restricts who they can offer therapy to. For example, a women's domestic violence charity will only usually offer therapy to women experiencing domestic violence - men experiencing domestic violence, for example, would not usually be eligible for that service. Private therapy means that any client can access therapy regardless of the issues they would like to work with. Whilst some therapists may not be able to work with some issues, I will always try to help those clients I can't work with find someone else better placed. In our current economic climate almost all free counselling is session limited. Depending on funding, the NHS or charity could offer just 4 sessions, perhaps even fewer. Sometimes that is all that is required for a client, but sometimes a client might prefer to work at a more in-depth level. Private therapy allows clients themselves to decide the right number of sessions for them and not organisational funding.